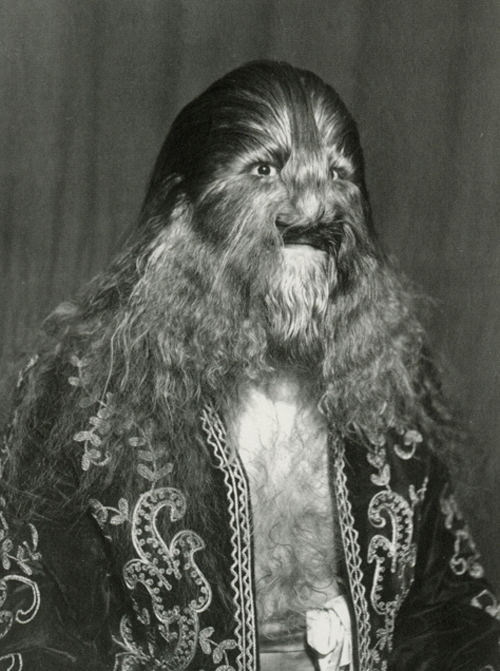 Stephan Bibrowski (1891–1932) was better known as Lionel the Lion-faced Boy (later “Man”), owing to a rare condition called hypertrichosis which caused his entire body to be covered in long, silky hair. 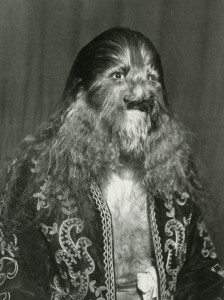 Born in Warsaw, Poland with an inch of fur covering his body, Stephan was essentially sold off to an impresario named Sedlmayer at the age of four. Sedlmayer sent Stephan to boarding school for a time. This cultivation would later pay off – Bibrowski’s reputation (and his act) were enhanced by his learned intelligence, his obvious exposure to literature, and the fact that he spoke five languages. On the other hand, Sedlmayer also gave him his stage name (and an appropriate back story concerning his pregnant mother’s traumatic encounter with a lion) and began exhibiting him around Europe. By this time, his facial hair was eight inches long; elsewhere on his body, it was closer to four. In 1901 (when he was 10), Lionel traveled to the United States to appear with Barnum & Bailey as a replacement for the recently retired Jo-Jo the Dog-Faced Boy. During his five years with the circus he learned tumbling skills from the acrobats, enhancing his act. In 1907 he returned to Berlin for a time where he was featured at the Passage-Panoptikum wax museum. Starting in about 1913 he made his home base New York, performing for 15 years with Coney Island’s Dreamland Circus sideshow. In 1928 he returned to Germany, his adopted country, to retire from show business. He died, reportedly of a heart attack, four years later.